We have a limited number of seats around the table for a festive lunch before the party cooked by our friends and chefs Ed Wilson and Thomas Lim. Lunch will start in the bar at 1pm. A seat at the table costs £50 for a glass of fizz on arrival and five courses of food. On the day you’ll be able to drink from a list of our favourite wines at celebratory prices. If you’d like to join us please send us an email via info@tuttowines.com as soon as possible to avoid disappointment. If you can’t make lunch, fear not, as from 5pm we’ll be welcoming one and all to the ‘Corners for the party proper. 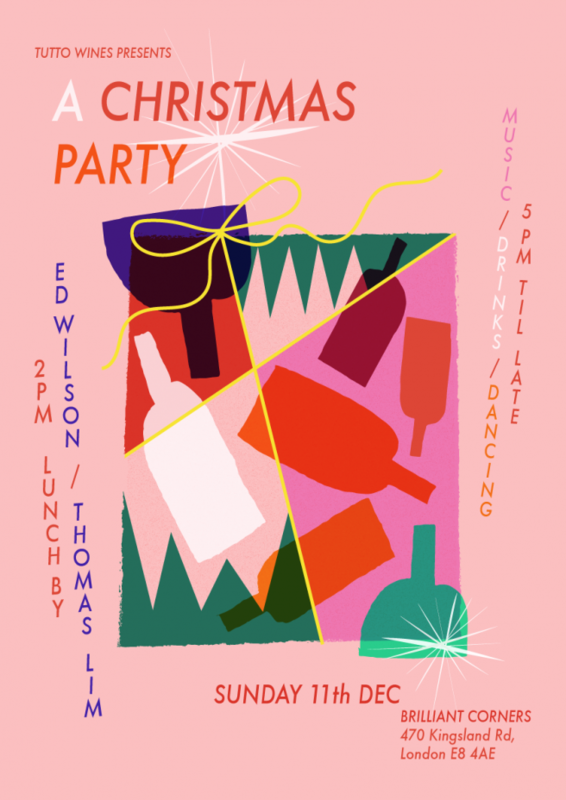 More food from Ed & Tom, drinks, dancing and music from our friends Phil & Jonny, under the mistletoe, all night long.